Introduction The ventricular ectopic QS interval (VEQSI) has been shown to identify structural heart disease and predict mortality in an unselected population. In ischaemic heart disease (IHD) risk stratification for sudden death is imperfect. We hypothesised that VEQSI would be greater in IHD patients who have suffered serious ventricular arrhythmias. Methods 12-Lead Holter recordings from 143 patients with a history of myocardial infarction (MI) were analysed; 38 had prior significant ventricular arrhythmia (66.2±9 years; 92% male); 105 had no history of ventricular arrhythmia (64±11.4 years; 71% male). All ventricular ectopic beats (VEB) were reviewed and VEQSI was measured for each VEB morphology. 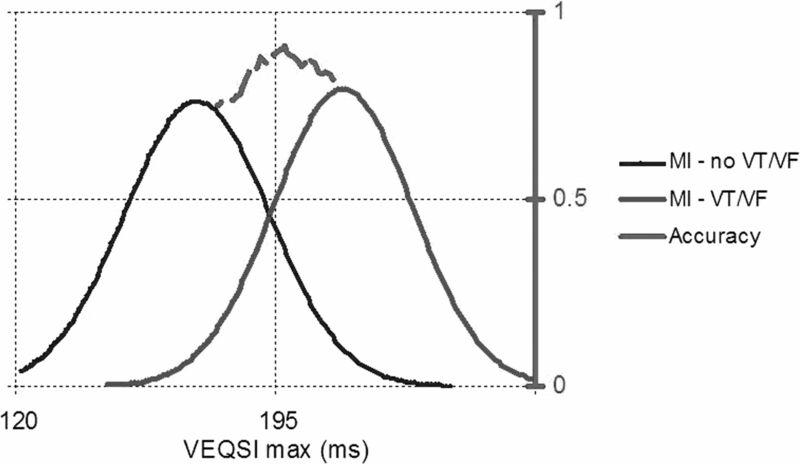 VEQSI max was recorded as the duration of the broadest VEB. Results VEQSI max was significantly longer in patients with a history of prior serious ventricular arrhythmia (214±20 ms and 172±21 ms respectively; p<0.001). Multivariate analysis established VEQSI max as an independent marker for previous life threatening events (OR 1.11; 95% CI 1.07 to 1.16; p<0.001). VEQSI max >195 ms had 86% sensitivity and specificity for distinguishing patients who had suffered significant ventricular arrhythmia (LR 6.39; accuracy 0.86; p<0.001).